A Monoblock RD 300 drain by ACO. ACO, a leading manufacturer of internal and external surface drainage systems, has delivered high-performance surface water management systems to some of the busiest airports across the world. 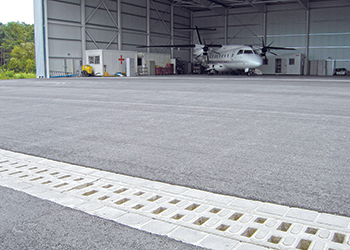 Effective management of surface water from all passenger, vehicle and aircraft environments is essential if an airport is to operate safely and reliably, says a spokesman for the Dubai-based ACO Systems, ACO’s regional office. Major projects in the GCC and wider Middle East region that have installed ACO systems include Cairo International Airport in Egypt, Abu Dhabi International Airport, Hamad International Airport in Doha, Qatar, Muscat International Airport, Rass Al Hadd and Salalah international airport in Oman, Kuwait Airport, Queen Alia International Airport in Amman, Jordan, and the King Al Fahd International Airport in Dammam, Saudi Arabia. With an aim of supporting its customers, ACO provides engineers and contractors with the technical support and guidance to ensure every installation maintains its optimum performance, says the spokesman. ACO Group manufactures and supplies corrosion-resistant polymer concrete, stainless steel and plastic, internal and external surface drainage systems. It also supplies intelligent solutions for grease and oil separation, as well as waste water management systems for the treatment and reuse of black water. Its products have applications in many segments and sectors, including hotels, road construction, airports, sports stadiums, open air architectural and landscaping structures. ACO has a warehouse and office located in Jebel Ali Free Zone in Dubai from where it provides services and support throughout the region for ACO distributors and their customers in the Middle East.